An easy step-by-step recipe for Mexican Rice, Mexican Rice Recipe, Quick Mexican Rice Recipe, Free Mexican Recipe, Cooking Mexican Rice, Yummy Mexican Rice Recipe. If you have been looking for a perfect Mexican Rice Recipe without any chunks, then try out our expert recipe. This quick and easy way of making delicious Mexican Rice have been tested and tried, so you can try it without any doubt. · Place the rack in middle and preheat the oven to 350. · Make a puree of tomato and onion in a mixer. Transfer the puree in a measuring cup and keep aside 2 cups. · Remove seeds and ribs from 2 jalapenos and mince flesh and set aside. Also, mince the remaining jalapeno and set aside. · Now, put rice in a strainer and rinse under cold water for 1 minute. Then, shake rice to remove excess water. · Take a heavy bottomed oven safe 12-inch saute pan and heat oil in it. Pour few rice grains in and see it they sizzle, then add the remaining rice and stir-fry for 6 to 8 minutes until rice is light golden and translucent. · Reduce the heat and add garlic and 2 minced jalapenos and then cook for 1 ½ minutes. · Mix broth, pureed mixture, salt and tomato paste. Increase the heat from medium to high and then boil. 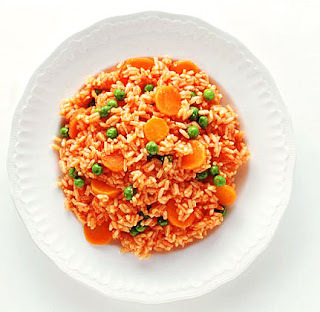 · Now, cover pan and transfer pan to oven and bake for 30 to 25 minutes until the liquid is absorbed and rice is soft. Don’t stir till 15 minutes. · Mix cilantro, minced jalapeno and lime.